Astronomie - Sind Schwarze Löcher Türen in eine andere Welt? Astronomie - Komet 29P / Schwassmann-Wachmann 1 weiterer Ausbruch. . . Aufs Neue! Raumfahrt - Kann NASA und China im Weltraum zusammenarbeiten? On July 24, 2016, NASA’s Interface Region Imaging Spectrograph, or IRIS, captured a mid-level solar flare: a sudden flash of bright light on the solar limb – the horizon of the sun – as seen at the beginning of this video. Solar flares are powerful explosions of radiation. During flares, a large amount of magnetic energy is released, heating the sun’s atmosphere and releasing energized particles out into space. Observing flares such as this helps the IRIS mission study how solar material and energy move throughout the sun’s lower atmosphere, so we can better understand what drives the constant changes we can see on our sun. 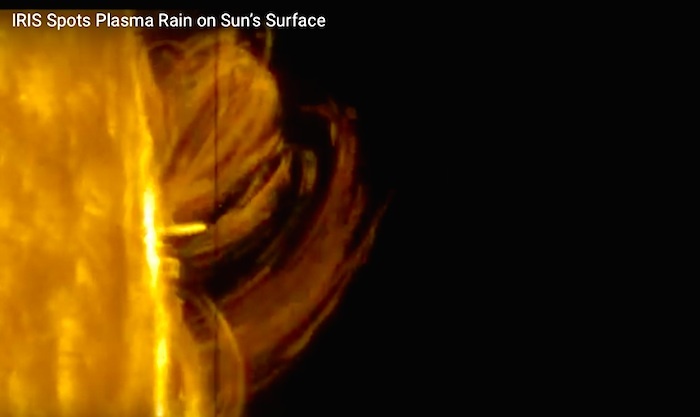 As the video continues, solar material cascades down to the solar surface in great loops, a flare-driven event called post-flare loops or coronal rain. This material is plasma, a gas in which positively and negatively charged particles have separated, forming a superhot mix that follows paths guided by complex magnetic forces in the sun's atmosphere. As the plasma falls down, it rapidly cools – from millions down to a few tens of thousands of kelvins. The corona is much hotter than the sun’s surface; the details of how this happens is a mystery that scientists continue to puzzle out. Bright pixels that appear at the end of the video aren’t caused by the solar flare, but occur when high-energy particles bombard IRIS’s charge-coupled device camera – an instrument used to detect photons.